We are in the knockout stages of the FIFA 2018 World Cup, and the first match of this round is between two former World Champions, France vs Argentina. France XI vs. Argentina(4-2-3-1): Lloris; Pavard, Varane, Umtiti, L.Hernández; Kanté, Pogba; Mbappé, Griezmann, Matuidi; Giroud. 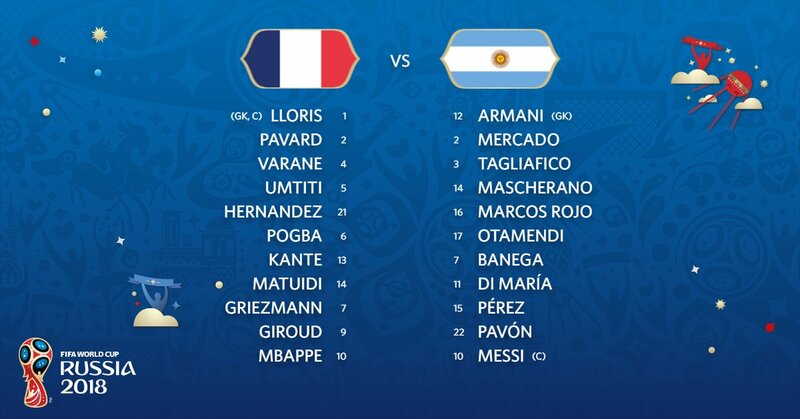 Argentina XI vs. France (4-3-3): Armani; Mercado, Otamendi, Rojo, Tagliafico; Enzo Pérez, Mascherano, Banega; Pavón, Messi, Di María.